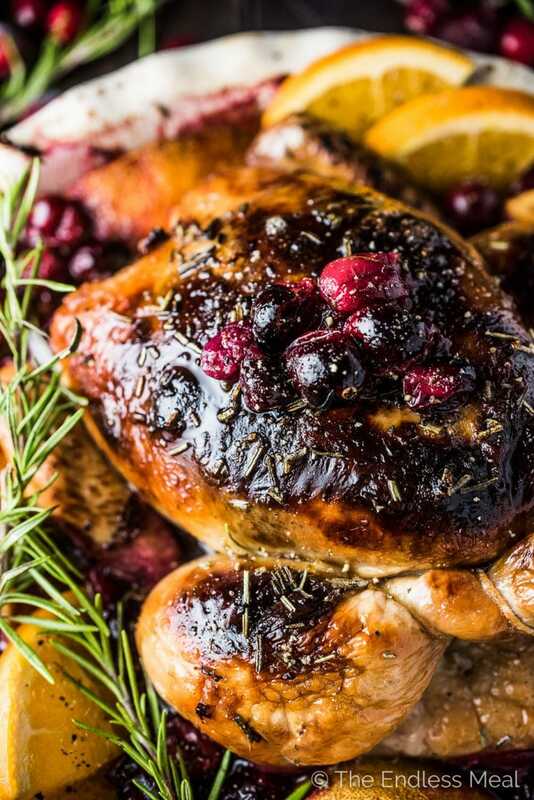 This crazy delicious Orange Cranberry Roast Chicken is covered with rosemary balsamic butter to keep it tender and juicy. It's a super easy to make and healthy recipe that is as perfect for a weekend dinner as it is for a special holiday meal. Warning … Christmas chicken recipe coming atcha! I've been keeping this recipe with you for what feels like ages now. It's not that I didn't want to share it, it's just that I thought November was a little too early so I forced myself to sit tight. Now that we're full on in holiday spirt mode, I thought now is a perfect time. 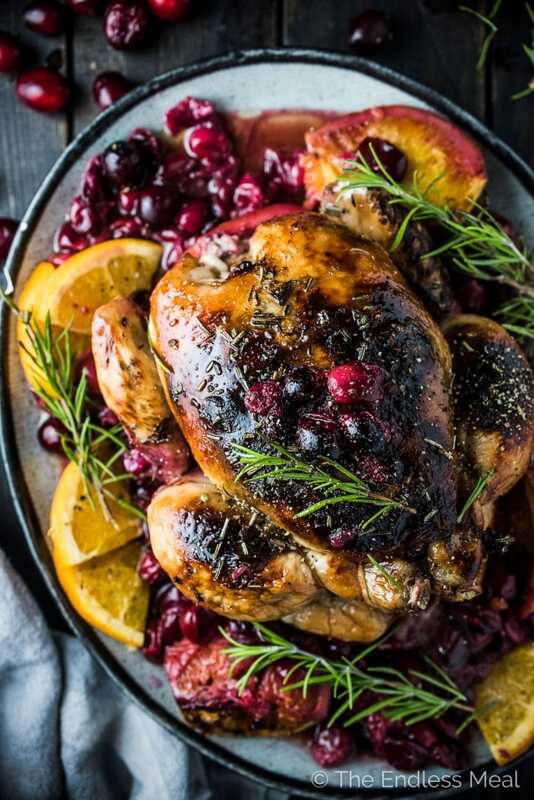 This cranberry roast chicken could easily be cranberry roast turkey if you let it hand out in your oven a little longer. Or you could simply roast a couple of chickens if you're cooking for a crowd. 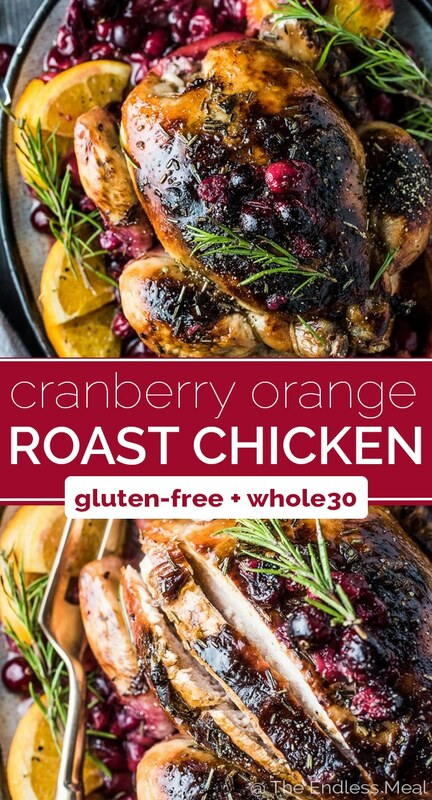 Either way, sitting your bird on a bed of cranberries and oranges and smothering it with rosemary balsamic butter is totally the way to go. 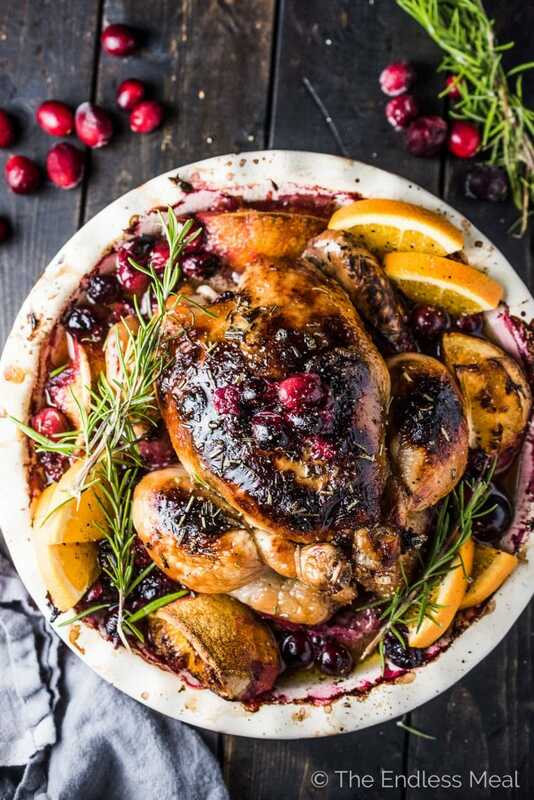 So I've got to be honest, I've been dreaming of cranberry roast chicken ever since I saw my friend Lindsay's One Pan Cranberry Balsamic Chicken recipe pop up on my Pinterest feed a few months ago. I knew that I had to make my own recipe with those delicious flavors. It was right around the time I made that Herb Lemon Butter Roast Chicken recipe for you. I made a pact with myself that I'd share more roast chicken recipes with you because they're the easiest and most delicious things ever. Healthy, delicious, and easy to make is the mantra of this blog and roast chicken nails all of those. 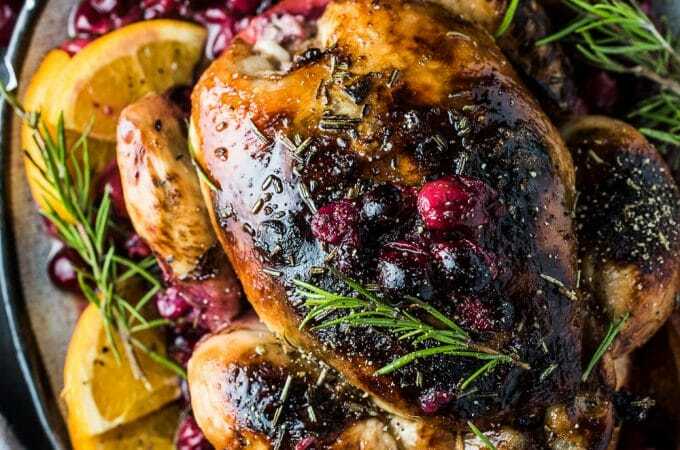 This cranberry roast chicken is as good as it sounds. The cranberries cook into a kind of cranberry sauce for the chicken that you can spoon on top when you serve it. So good! 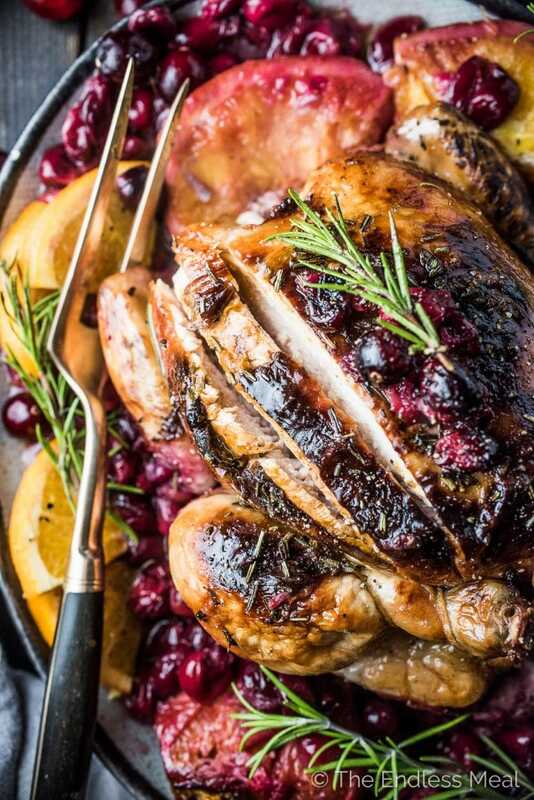 The first time I made this cranberry roast chicken, my heart sunk when it came out of the oven. It was black. All over. I almost cried. ← that happened. I couldn't figure out how I burned the skin to a crisp. It looked terrible! I thought maybe it was the pan I used that held the chicken up high, or maybe it was because I forgot to set the timer and it had been longer than I was guessing. I put it on a plate for us to eat, figuring we could sadly peel the skin (the best part) away and the rest of the chicken would be salvageable. Black skin doesn't equal burned skin. What I didn't know the first time I made with, is that the balsamic vinegar will turn the skin black. Just like you see in the picture. It's not that way when you put it into the oven, so it was a major, tear-inducing shock when it first happened. So when you make this, don't worry when you open the oven. The back skin is only extra delicious balsamic skin. Preheat the oven to 420 degrees. Dry the skin of the chicken with paper towels. Place the cranberries and rosemary in a small roasting pan. Mix the Rosemary Balsamic Butter ingredients together in a small bowl. Spread the butter under the skin of the chicken, being careful not to break the skin. Lay the chicken on the cranberries. Cut the orange into quarters and squeeze the juice over the chicken then nestle the quarters around the chicken. Roast the chicken for 45 mins then reduce the heat to 350 and continue roasting for another 45 mins. Remove the chicken from the pan and serve with the cranberries spooned over the top. Have you ever made a gravy with the pan dripping? I haven’t made a gravy with it but I always serve the pan drippings on the side and they’re delicious! This chicken is as pretty as it is tasty. We served it to guests and everyone loved it! So happy to hear it was a hit! I tried this recipe for our Christmas dinner this past week, and oh my God, Kristen!! Everyone raved! Not only was the chicken absolutely gorgeous coming out of the oven, but it was roasted to perfection and the flavors were amazing! Using the cranberries as a bed for roasting the chicken is absolutely brilliant and SO delicious! I had lots of lemon and onion on hand, so I decided to add a few wedges of each to the bed of cranberries and orange, and stuffed some in the cavity as well. They all mixed beautifully. I was a bit nervous to try the balsamic vinegar considering the other dishes I was serving so I just went with a rub of butter and some S&P this time, but I’ll definitely try the balsamic version next time (and that will be soon!). Served this with your equally brilliant Late Autumn Shaved Brussels Sprouts Salad, a vegetarian baked ravioli, and good hot bread. What a perfect dinner! Thanks so much for the wonderful recipes– you made our holiday meal a huge success. Wow … your Christmas dinner menu sounds amazing! Thank you so much for including two of my recipes! !